He's cool because he's green. All the cool kids are. Orange has unveiled plans to use a seven metre wind turbine to power mobile phones during the Glastonbury festival this year. 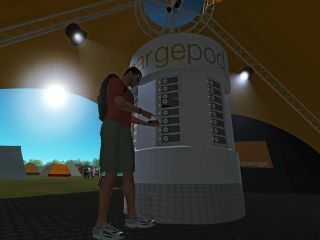 The recharge pod will be available to all festival-goers to keep them charged throughout the 72-hour mud-a-thon. Users will be able to connect their device to the turbine inside a tent and chuck them in a locker for 45 minutes to get a charge. Orange is trialling the technology to see whether it might ultimately be able to power the whole of its Chill ‘n’ Charge venue at the outdoor festival.